Comments about this article below. 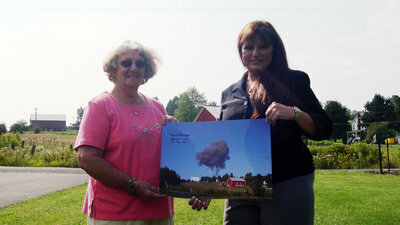 Val McClatchey stands with Phyllis Musser, left, while holding McClatchey's photo titled, "End of Serenity." Musser owns the red barn captured in the photo. Life changed in a single camera click on Sept. 11, 2001, for Somerset County resident Val McClatchey. McClatchey’s infamous photo captured a mushroom cloud from the crash site of United Airlines Flight 93 rising above a red barn and the rural Western Pennsylvania landscape. For nearly 10 years McClatchey’s photo, which she titled “End of Serenity,” was the earliest known image captured following the crash, until a video surfaced earlier this week. The video, taken by the late Dave Berkebile, of Berlin, shows a cloud of smoke rising from the crash site. McClatchey herself had known about the video, and even had a copy, since the 5th anniversary of Sept. 11, 2001. “I had a message from my husband saying, ‘you’re not going to believe this,’” McClatchey said. She said Berkebile gave her the video when he heard the authenticity of her photo was being criticized. “He said, here’s your proof,” McClatchey said. The video was kept private until McClatchey gave it to the National Park Service for an oral history leading into the 10th anniversary of Sept. 11. She donated it on behalf of Berkebile who died in February. For McClatchey, the video lends further credibility to her photo. The photo, time stamped at 10:05 a.m. Sept. 11, 2001, and shot on her Hewlett-Packard 315 point-and-shoot, has been a subject of controversy since it was taken. During the years, conspiracy theorists and bloggers have shown up on her doorstep harassing her, and bloggers have smeared her name on the Internet. “Google my name and I’m a fraud,” she said. McClatchey holds a copyright on the photo, prohibiting its use. She’s written complaints to Google asking that they remove her photo from Internet sites, but those complaints have come to no avail. McClatchey was also involved in a lengthy lawsuit with the Associated Press over their use of the photo. The lawsuit resulted in a settlement. McClatchey describes the photo as a mixed blessing. She admitted that there have been times when she wishes she hadn’t taken it. Her photo hangs in the Smithsonian Institute in Washington, D.C., and will soon hang at the Flight 93 National Memorial. After the 10th anniversary of Sept. 11, 2001, this weekend, McClatchey said she’s looking forward to moving on. She does plan to make one more public appearance, however, in 2012. Her photo will be displayed at the National September 11 Memorial & Museum in New York City. First, notice the vast difference in quality of the photo taken by the DailyAmerican reporter versus Val's photo taken with a 10 yr old HP 315 point-and-shoot digital camera. See here about the suspicions of the newly released Dave Berkebile video that supposedly vindicates Val's photo. It says the timestamp on her photo is at 10:05 am. Officials are saying Val took her photo approx 5 seconds after the alleged Flight 93 impact. I wouldn't make too much of this since times on a camera are input manually, so a camera's internal time could easily be off due to human error. Now here's where it gets into some very misleading statements. No one I've heard has "shown up on her doorstep" regarding her photo controversy. The only people I know who meet her in person were Victor Thorn and Lisa Guliani, who called and made arrangements with Val to meet with her at her business, in which they said Val was all to willing to meet and discuss her photo with them. At the time of this arranged meeting, Victor and Lisa assumed the photo was real, but thought Val had accidentally taken a photo of an ordnance blast instead and that's what they wanted to discuss with her. They said Val's demeanor turned sour and hostile after this. About "smearing her name on the internet," is questioning someone's photo smearing the photographer's name? As to Val saying google her name and it says she's a fraud, go ahead and do that and decide for yourself if it says that. In the first mainstream article by the PostGazette that reported about her photo controversy, the yellow journalist reporter made it look like I was calling her a fraud by saying the following in the article: "On a simple Google search, Mrs. McClatchey's name now pops up in the same sentence as 'total fraud.'" Let me remind everyone what the title of my original photo controversy blogpost said: "Val McClatchey Photo: More Smoking Guns, or Total Fraud?" They all seem to forget the word "photo" was in my title. The thing about Val claiming she was in the red after her AP lawsuit, just like her claim that all her profits from her photo sales were forwarded to the now-defunct Todd Beamer Foundation via the honor system, we only have Val's word to go by because there has never been a paper trail. Open your books, Val! It insinuates the photo is a fraud. Since she made that photo, following this logic she is obviously a fraud as well, don't you think so? What makes you think she is lying? Your arguments are very weak. From the photos of the 'crash site' and the plume I'd say it looks like a 'Daisy Cutter' bomb exploded there - not an aircraft.